Just got my new dock a few days ago and decided to post some pictures and write a quick review since when I was looking to purchase it I couldn't find much info online. Quick side note: I have heard the W520 will run off of a 135W power adapter which would be nice to use for travelling but didn't want to risk ordering the 135W dock and having it not work. The dock I ordered was a 433830U and it has the following part numbers on the bottom: P/N 75Y5730 and FRU P/N 75Y5731 Interestingly the specs say 20V 4.5A which corresponds to 90W. From talking with others it appears that internally all of the Mini Dock Plus Series 3 are identical but they come with different power adapters and may or may not have a keyed power socket. 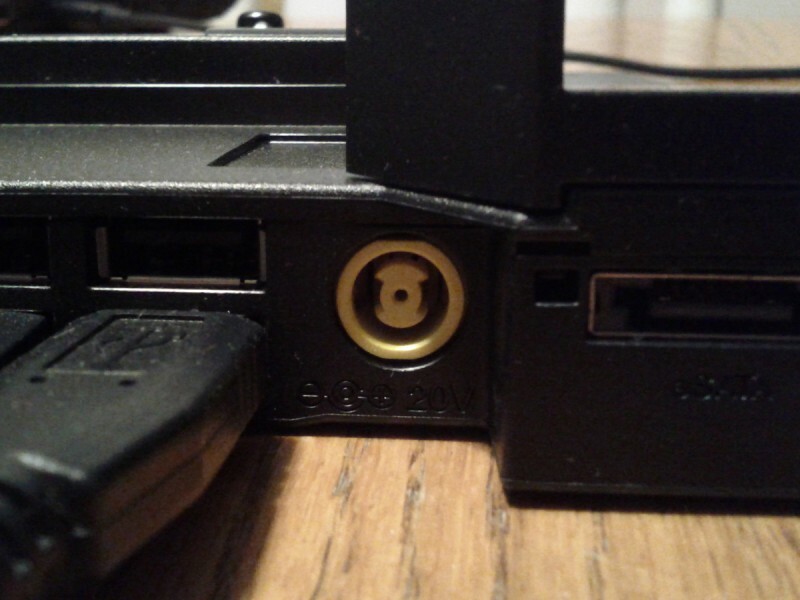 The keyed plug is to prevent the 170W adapter from being plugged into an older ThinkPad, you can still plug an older ThinkPad's power adapter into this dock. The power adapter that came with my 170W dock was the exact same as the one that came with my laptop, P/N 45N0113 and FRU P/N 45N0114, 20V 8.5A (170W). The dock itself seems quite well manufactured but it better be given the price (269.99 CAD). It consists of a narrow wedge with a large cube on the back left corner. The cube has a locating device to make it easy to insert a laptop into the dock as well as the eject button, a power button, and the key lock. This is a pretty awesome selection and while I personally would've liked to see some HDMI ports I can totally understand why Lenovo chose to use the royalty free DisplayPort instead. Since DisplayPort to HDMI cables are available it isn't a problem just slightly inconvenient given that monitor manufacturers seem to all love HDMI. My one MAJOR complaint is the location of the audio connectors. They are mounted on the right side of the dock and are completely inaccessible when a computer is docked. I guess they are intended for desktop speakers and a microphone but I'd like to be able to use them to plug in my gaming headphones that have a speaker and a microphone jack (the W520 does not have separate speaker and microphone jacks requiring a two to one adapter to use dual jack headphones). The other big feature of the dock is the ability to use multiple displays. Lenovo claims three external displays plus the laptops display itself can be driven if using the dock and an Optimus enabled laptop. I have yet to try four displays but found it worked well for a single external monitor. Audio ports are in the dumbest possible location. Overall a very nicely engineered piece of hardware. I'm quite satisfied and probably will purchase another dock with my next laptop. If you are constantly unpacking your laptop its nice to have a dock in at least one location. My friend was just looking to purchase one of these. I'll pass on the link. Thanks. Does it have fans inside? Does it have fans inside? When you use it for long, do you have any problem with heat? There are no fans but it elevates the whole back of the laptop and has space underneath for air flow. I've had no problems with heat even during the occasional gaming session. Does it have port that allow you to insert DVD Rom or 2.5 HDD? Does it have port that allow you to insert DVD Rom or 2.5 HDD? If it has this port, we can convert it to 2.5 HDD port. It would be nice if we have the second storage at home for a data backup. There are no fans in it but it does have an eSATA port and multiple USB ports so you can plug in a portable hard drive. It is a nice mobile station. I would like to buy a dock. 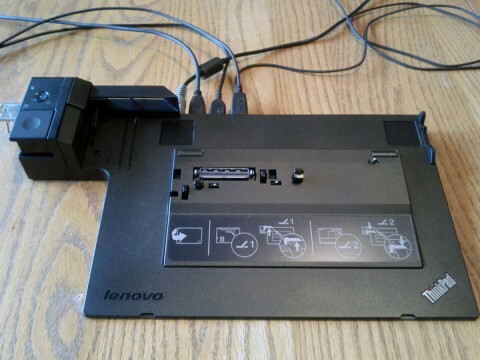 However cost so much:( How about buy a used ThinkPad Mini Dock Plus Series 3 90W - 4338-10U. The factory should have the same assembly line for the dock part. I think this is an interesting idea but I'm not sure it would work. Although the different models are probably almost identical the 170W version has the keyed power socket. I'm pretty sure it would accept a 135W or 90W power adapter but I don't think the 170W adapter can plug into anything other than the W520. Update: I just tried my 170W power adapter in a T61 that I had laying around and it doesn't fit. 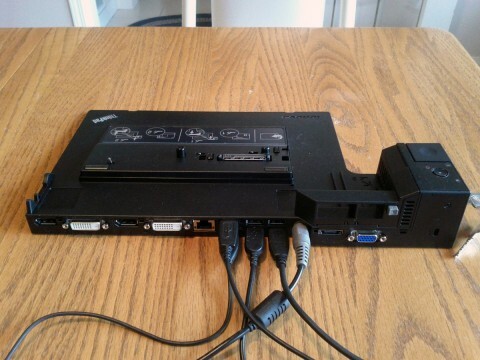 I wouldn't be surprised if the 90W dock has the same socket on it. Could you turn over your W520 dock over? Just check that "the INPUT Data". I found out that for dock 4338-10U and -30U, INPUT: 20V--4.5A; My W520 AC Adapter has OUTPUT for 20V--8.5A. If your dock has an INPUT of 20V--4.5A, then we can assume that TYPE 4338-X0U are all the same, except the AC Adapters. My dock has 20V--4.5A which would be 90W on the bottom. Just saw a picture of dock 4338-20U. They have different sockets than my AC Adapters. Maybe I should just spend $150. I'm curious now because my dock has 20V--4.5A which is 90W on the bottom. It would be really stupid if the docks are all identical except for the AC adapters and the power sockets. That is correct and very annoying. For some reason all the AC adapters I have that fit the 433835U dock are 90W and they can't power it. That dock needs a 170W AC with the right socket plug and you can't buy just that adapter for that dock. You have to buy a new dock with the 170W AC. I am done with Lenovo. I have this same set up. I am not able to boot to an external monitor though. On a previous model I would just dock my laptop, power up and the video would show on the external monitor. With the W520/4338-30U combo, I have to open the laptop while docked and log into my system. Then fiddle with FN+F7 buttons to get the external monitor to show a picture. Did you have to do anything special to make this work? I don't actually use the Fn + F7 to control docking. Windows 7 has a built in shortcut to do it Windows + P.
I have it set to extend and whenever I dock the laptop it automatically connects the second display. I'm not sweating it as USB3.0 isn't as fast as eSata, and I don't (currently) have a huge need for it. I could always plug it into the side 3.0 port anyway. You could always try and cancel the order? Not sure how many USB 3 peripherals you have though... I'm pretty sure I only have one. BTW totally agree with you on the keyboard thing. I'm not really sure what they're thinking??? I don't think they do a good job of isolating the signal when they pass it to the dock so I imagine this is just electrical interference. I get the same with a W530 in the doc. Through the socket on the laptop is fine, but via the connector on the dock, there's something like a timer or something that turns the output on and off. Sometimes I miss the start of a system sound, get the click, then the rest of the sound. A second or so later I get the click as it turns off. 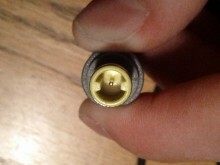 If there's a constant source of sound the outputs stays on so you don't get it. But if you are clicking around in Windows explorer and browsing folders for a while you keep getting the click on, click off, click on, click off. Worst design ever! DVI-D Dual Link on 433830U ??? Kevin in the specs you have the two DVI-D ports as being "Dual Link". Where did you get this information? All information I have found, from Lenovo, indicates that they are "Single Link". I have a 30 inch monitor (2560x1600) which requires a DVI-D dual link port. 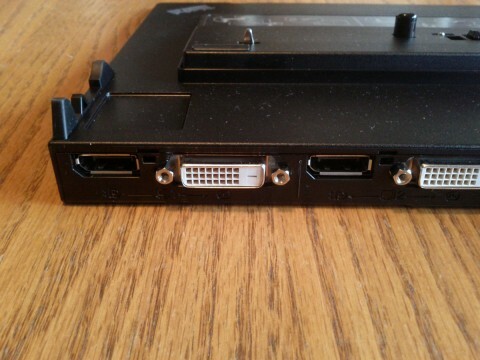 According to the image on Wikipedia the connectors are both DVI Dual Link. They are a single link and will not support a 30" monitor that requires a dual-link connection. As this is one of the first google results when searching for the dock, it might be a good idea to update the info if you get a moment. My W530 is also connected to the newest Mini Dock Plus Series 3 with USB 3.0 and I get the same popping noise as tommysss from the audio out on the dock. It's not electrical interference as Kevin stated because it only happens at the beginning and the end of a sound - i.e. if a system sound is played or you start foobar2000 and play the first song. You can stop a song and switch to another in foobar without this popping sound but when you end it or switch to media player it's there again. It seems to be more a driver problem than hardware related but I still didn't find a solution. Have you downloaded the latest drivers from Lenovo's site? I am not experiencing that issue but perhaps this is because I only have the USB 2.0 dock. I also had my speakers replaced under warranty because they died after about 9 months. Also, can I use the docking station without the battery plugged? There are no additional fans on this unit but I think it gets better ventilation because it is raised up so air can flow underneath it. I haven't noticed any difference in performance but then again I wasn't able to connect two DVI monitors without the dock. Lenovo 75Y5730 (433830U ) compatible with W530? Have an opportunity to pick up a used W530 with the 433830U (W520) dock? Any issues with it not working? I know dock is USB 2. I believe the docks are backwards compatible so this should work. do the usb ports provide power when the computer isn't docked?